• Large. fu ll-toned 5Y•-in. and volume; alarm. time and sleep switches. Connection for tape deck to play or record. speaker for late-night TV viewing .. you won't disturb a soul. Walnut-grained molded cabinet. 10'!·'.<xl6Yix10 \fi inches deep. F rom Japan. UL listed. ifll remember to wake you. plastic cabinet and clock housing. 5xl0x7'-'! in. deep. Dual powered for dual convenience . "C" size Battery for Radio above. (Uses 4). Rise and shine to black-and-white TV or buzzer alarm ..
inches deep. UL listed . From Japan. 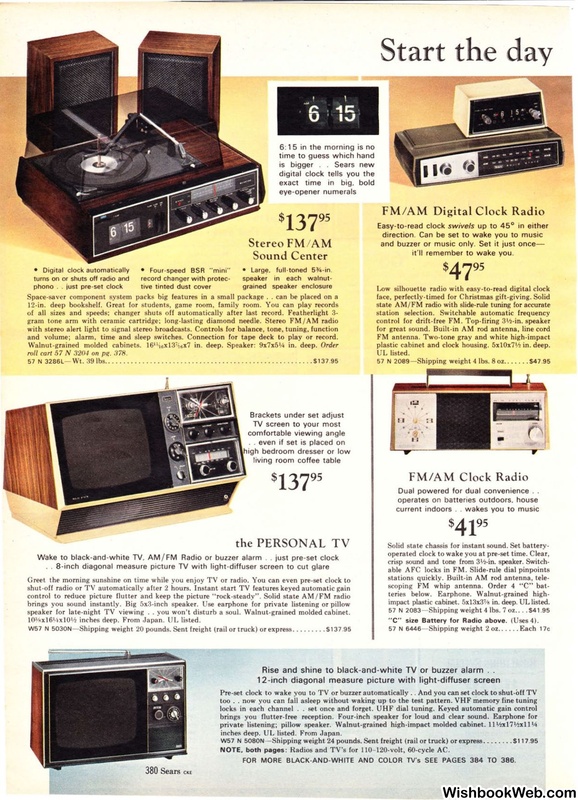 both pages : Radios and TV's for 110- 120-volt, 60-cycle AC . FOR MORE BLACK-AND-WHITE AND COLOR TV's SEE PAGES 384 TO 386.